4. Why was Thor such an important character in Norse mythology? Thor is the most outstanding of [the Æsir]; he is known as Asa-Thor [“Thor of the Æsir”] or Öku-Thor [“driving-Thor,” because he drives a goat-drawn chariot]. He is strongest of all the gods and men. Snorri’s assertion that Thor is the strongest god is supported by many of the names associated with the Thunderer. His children are named Magni (“strong one”), Módi (“angry one”) and Thrúd (“power”). His residence in Asgard is called Thrúdheim (“power-home”). 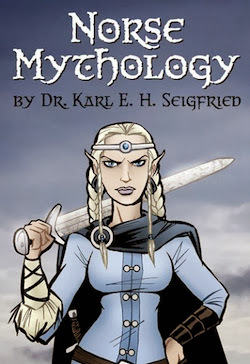 He wears a belt called megingjörd (“power-belt”) that, according to Snorri, doubles his godly strength when he buckles it on. All of this makes it very plain that Thor is one strong fellow. If not for Thor being out there to fight back the giants, their numbers would become large enough to threaten the very existence of humanity. What more important role could a god play than to fight against the forces that would destroy us all? 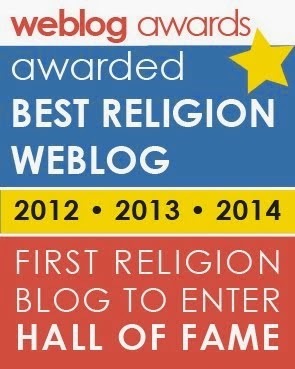 For all their gods, there are appointed priests to offer sacrifices for the people. If plague and famine threaten, a libation is poured to the idol Thor. Here we have a connection between the myths and the religion that helps to explain both. If you only read the myths, you might come away with the impression that Thor really is a superhero, like in the Marvel comics and movies. Stop and think about this last quote from Adam, though. Does Thor seem like a god of war? Does his power come from violence? No, his strength comes from providing the winds and rains that help the farmers to grow food for their people. Who are the enemies Thor fights? Plague and famine – forces that threaten the human community. Is this all starting to make sense? Thor isn’t really a “god of thunder.” Thunder and lightning are merely manifestations or signs of his power – the power to bring the rain needed by the farmers. In terms of religious belief, the enemies that Thor protects us from are things that threaten the community: plague and famine, but also other terrifying natural forces like avalanche, flood and wildfire – forces that are personified in the myths as giants. Although they can be read simply as exciting stories, the myths also symbolically represent the religious beliefs of the community that originally told them. If we are to have any hope of understanding what those beliefs were, we have to cross-check the myths with other sources – including written descriptions like Adam's, archeological finds, and artistic representations. By the way, doesn’t Adam’s description of Thor remind you a bit of Snorri’s description of Frey? As I said before, the roles of each god aren’t simple things that can be summarized by the formula “X is the god of Y.” There is a quite a bit of overlap between their domains. 5. Were any giants friends of the gods? I wouldn’t exactly call them friends, but there are several giants who are related to the gods and goddesses. We’ve already met Gerd, who marries the god Frey. 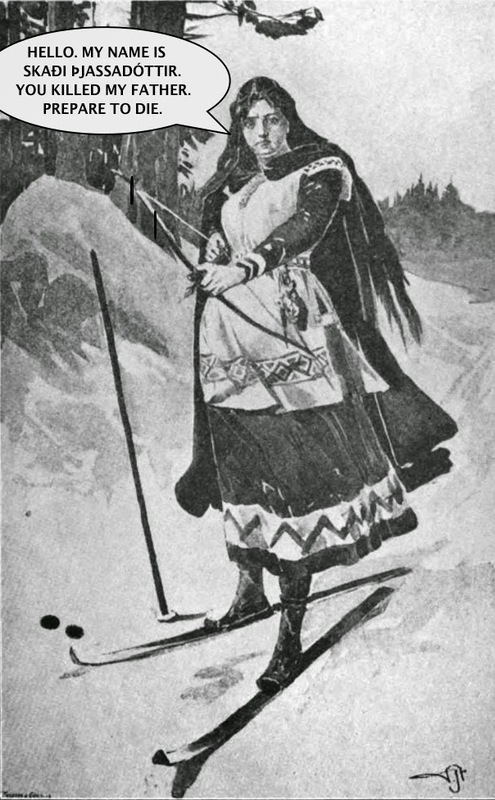 The giantess Skadi marries the god Njörd, even though the Æsir killed her father (it’s a long story). Gods marrying and/or having children with giantesses was not uncommon. Don't mess with an angry giantess. You may be surprised to learn that some of the gods are actually half-giant. In the world of the myths, it’s clearly the father’s line that determines the status of the child. If you have a god for a father, you’re a god; if you have a giant for a father, you’re a giant. There are many cases of a god/father and giantess/mother pairing, but I can’t think of a single case of a giant/father and a goddess/mother. Although many giants try to win a goddess for a wife, they never succeed. Maybe they would have been more successful in their wooing if they had tried conversation instead of kidnapping! Odin’s father is Burr and his grandfather is Búri, the fellow who was licked out of the salty ice by the magic cow at the beginning of mythological time. Odin’s mother, however, is a giantess named Bestla (possibly meaning “bark”) whose father was the giant Bölthorn (“thorn of misfortune”). Notice that both names connect the giants to the natural world. Thor is the son of Odin and the giantess Jörd (“earth”) – another representation of nature. So, two of the most important gods have mothers from among the giants. This makes the eternal enmity between the gods and giants seem like a family dispute between in-laws! This suggests that Loki and Odin swore blood brotherhood, which was a very serious thing and meant that they owed each other the loyalty of true brothers. Please note that Loki is not the adopted son of Odin – that’s a concept from Marvel Comics, not Norse mythology. He was not a big man, but he early developed a caustic tongue and was alert in trickery and unequalled in that kind of cleverness which is called cunning. He was very full of guile even in his youth, and for this reason he was called Loki the Sly. He set off to Odin’s home in Asgard and became his man. Odin always had a good word for him whatever he did, and often laid heavy tasks upon him, all of which he performed better than could have been expected. He also knew almost everything that happened, and he told Odin whatever he knew. This makes Loki seem less like a friend or blood brother and more like a servant. The last line even puts him on par with Odin’s two ravens who travel the nine worlds and report what they see back to Odin. This servile role is a pretty far cry from the blood brotherhood suggested in the poem. Which version of Loki (if either) is closer to how people thought of Loki in the Viking Age? In the stories that survive of Loki in the mythology, he does often seem more like a servant than an equal. Sometimes, he even seems like a sort of court jester who provides comic relief. Scholars have been arguing over the question of Loki for a very long time, and the issue is far from settled. 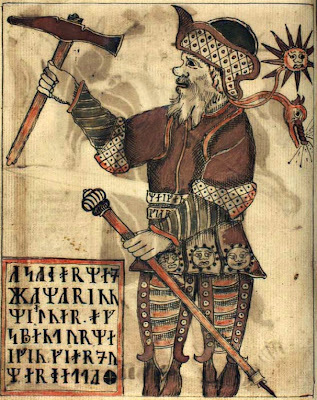 In the myths recorded in Iceland, Loki goes on adventures with both Odin and Thor. He sometimes seems quite a social sort of fellow, if not entirely trustworthy. However, Loki also assaults Thor’s wife Sif by cutting off all of her hair, publicly insults all the gods and goddesses, turns the goddess Idunn over to the giants, lures Thor into the hall of a hostile giant without his hammer, and wickedly causes the death of Odin’s son Balder. At the end of time, he will [SPOILER ALERT!] lead the forces of darkness against the gods, kill the god Heimdall and help to destroy the world. I’m not sure if you’d really count Loki as a friend, in the end. 6. What importance did Thor's hammer have? Their decision was that the hammer was the best out of all the precious things and provided the greatest defense against frost-giants. Used as a weapon, Thor’s hammer keeps the giants from overrunning the worlds of gods and humans. I discussed above how the mythic giant-fighting of Thor can be understood in terms of religious beliefs. The myths also mention another use for the hammer – one that again seems to reflect ancient religious practices. After Odin's son Balder is killed, the gods take his body to the sea and give him a funeral by placing him on his ship, launching it into the water, and setting it aflame. 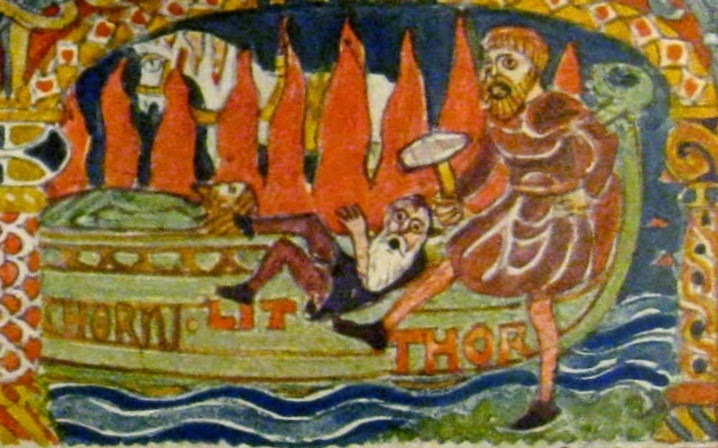 Immediately after the ship is set on fire, Snorri tells us that “Thor stood by and consecrated the pyre with Mjölnir” – he blesses the funeral pyre with his hammer. That’s very different from busting a giant in the head with it, isn’t it? Thor kicks Lit before blessing Balder's funeral pyre with his hammer. It's hard out here for a dwarf. There’s also a myth about Thor dressing as a woman in order to marry a giant (again, it’s a long story). It includes the idea that the hammer was used during wedding ceremonies “to sanctify the bride.” Again, we find the hammer being used for a ritual blessing – a role that is quite distinct from its use as a weapon. This may all seem a bit strange, but it’s reflects a very ancient symbolic role for the Hammer of the Gods. 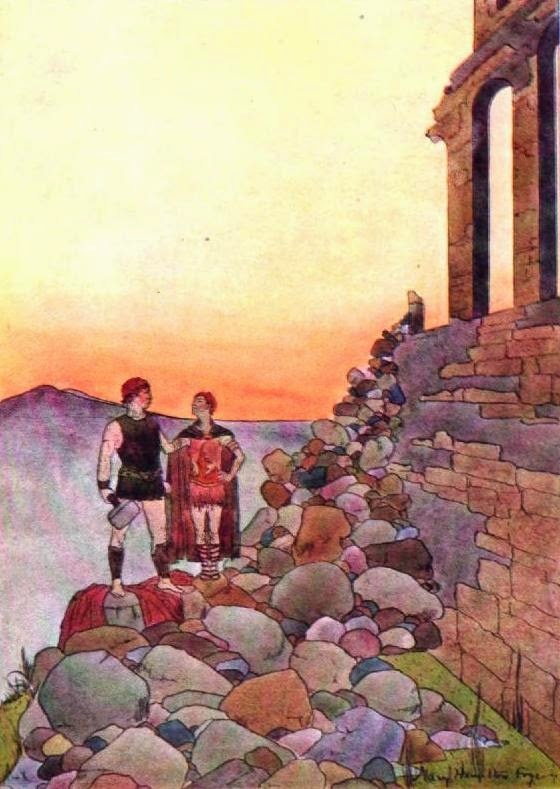 Thomas A. DuBois has pointed out that Thor’s blessing of both the funeral pyre and the bride “appear paralleled in human rituals connected with burial and weddings.” In addition, Hilda Ellis Davidson states that “the hammer was raised to hallow the new-born child who was to be accepted into the community.” Birth, marriage and death – Thor’s hammer blesses the major events of life. Long before there were Norse myths, long before there were Vikings, people living in what we now call Sweden during the Bronze Age made rock carvings showing a large figure holding a hammer or axe over an embracing man and woman. There are other carvings that also suggest this blessing function of the weapon, and archeologists have found actual axe heads that seem to have been given as offerings to the gods. In the Viking Age – 2,000 years after the Bronze Age – there are large memorial stones in Sweden and Denmark with images of Thor’s hammer and messages to Thor written in runes asking the god to bless or hallow the message and the memorial. There are also Thor’s hammer necklaces that have been found in burial sites in many places from many times. 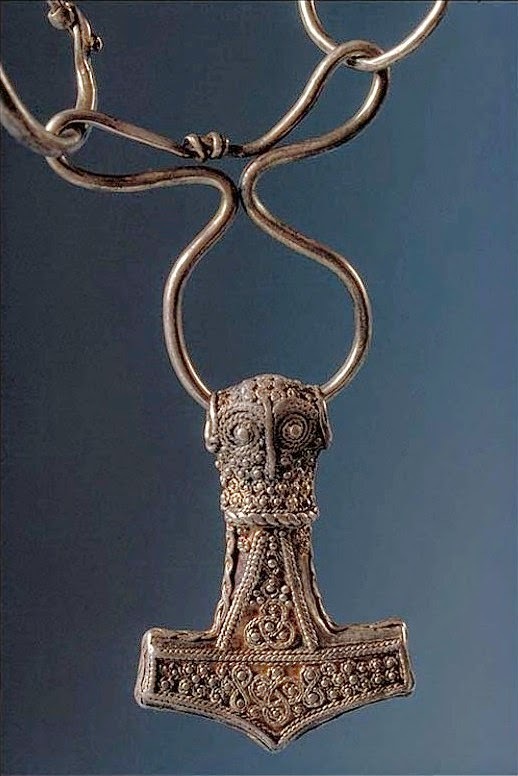 Christopher Abram points out that “[w]here Thor’s hammers are found in graves, they are more likely to be the resting-place of a woman than a man,” which seems connected to the idea of the hammer being used to sanctify the bride. Taken together, this all suggests a blessing role for Thor’s hammer in religious life, in addition to the protective role I discussed earlier. Thor’s hammer is a symbol of the god blessing and protecting people throughout their lives – from their welcome into the community at birth, through their acceptance of adult responsibilities at marriage, to their departure from the community at death. Thor’s hammer, then, is a symbol of all the things that bind a society together and keep them safe. In light of this binding idea, it’s interesting that another Old Norse term for the gods is bönd (“bonds”). The gods help keep us together. I have to say that I would like to know more about the dwarves. If they were so relied upon by the gods, then they are worth examining.